Proactive management of intellectual property (IP) is essential for any R&D organization. Being proactive leads to better, more thoughtful decisions about patenting, resource allocation, and other strategic choices. It also helps you focus on achieving your IP goals rather than reactively putting out fires. Fuentek has helped scores of technology transfer offices (TTOs) and other clients achieve IP management successes. Here are some of those best practices that can make your TTO or other IP operation more proactive, efficient, and effective. If it has been a while since you reviewed the IP portfolio, analyze it now and prioritize what you have. This lets you focus resources on the innovations with the greatest potential for success. Prioritizing and optimizing the IP portfolio has other benefits as well, especially when there is a backlog of innovations awaiting a disposition decision. It can be hard to make time to analyze and prioritize your portfolio, especially when your office staff are overwhelmed with cases. Yet, that is exactly when it is most important to take a strategic look at what you have that’s valuable… and what’s not. To help address this, Fuentek provides Portfolio Optimization and Prioritization as a service. We have achieved excellent results for our clients (example) and we have several efforts currently underway using our newest techniques. We also have shared our insights on tackling the IP portfolio in blog posts and webinars for companies, universities, and other R&D organizations. When it comes to an innovation’s commercialization potential, the market’s need for it is as important as (if not more than) its technological advantages and whether the IP can be protected. So, before filing for a patent, proactively screen the technology for its market fit. When a technology does fit the market, dig deeper with more research as you ramp up to marketing. Then leverage this information to plan an effective strategy for securing licenses or an industry partner to sponsor/collaborate on further R&D. For more specific advice, check out our webcasts and blog posts on technology evaluation and strategy development. Develop effective marketing collateral by thinking through the AMMO (audience, message, mechanism, and outcome). Write engaging online listings for every technology that’s available for license. If the innovation is of interest to a market with lots of players, host a webinar-based technology briefing. If the innovation has broad market potential, prioritize your targets. Be realistic about the technology and its market potential so you know when to push. You can read more Fuentek insights on marketing technologies or check out our free webinar on effective technology marketing. Have prospects submit license applications in phases, which expedites negotiations. 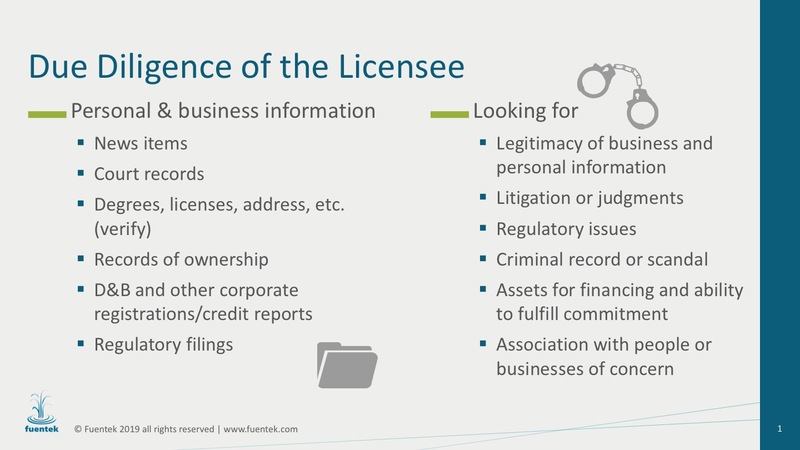 Always do your due diligence on license applicants (see slide graphic below). Use multiple deal valuation techniques to find a valuation convergence range to ensure you’re setting a reasonable royalty rate. If your goal is to increase royalty revenue or create jobs, focus on licensing to well-established, small-to-medium enterprises rather than to startups. Take a creative approach when constructing offers and counter-offers. All of this guidance is based on Fuentek’s experience working with more than 4,000 technologies from a wide range of R&D clients. Contact us today to discuss how you can benefit firsthand from this expertise. We can train your professional staff and/or interns or provide direct support from our highly experienced team utilizing our cutting-edge approaches.